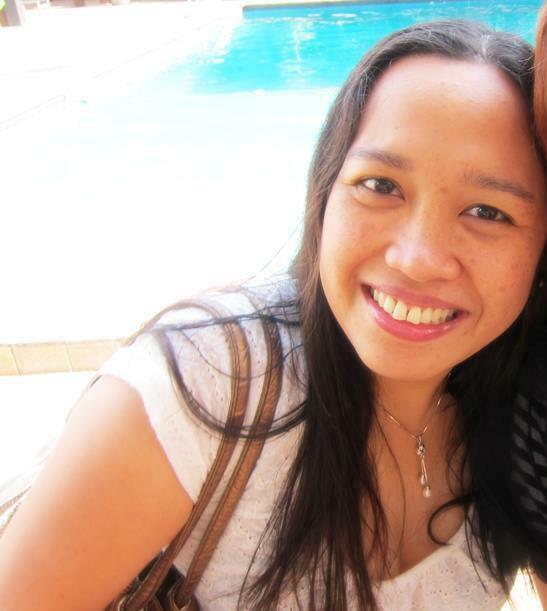 Almost two years ago today, I was granted a 10-year, multiple entry visa by the United States embassy in Manila. I was ecstatic; with the US visa, I didn’t have to spend Christmas with drunk backpackers in a hostel in Peru and instead celebrate it with cousins in Delaware. I could visit the museums in Washington DC, too, and stroll around Central Park in New York. Knowing how winters are like in the U.S. East Coast — bitterly cold, with blizzards and ice storms known to cripple the city for days — I fully expected to see white Christmas in the Big Apple. Thus, when I arrived in New York in December, I was very surprised. There was no snow, it wasn’t even that cold! Rather, it looked and felt like a fine autumn day. I wore a thin jacket, and I didn’t even feel the chill. Needless to say, I was disappointed. With my dreams of frolicking in the snow dashed by El Niño, I did what any self-respecting tourist in New York would do: I watched Broadway shows in Times Square and walked around Central Park. 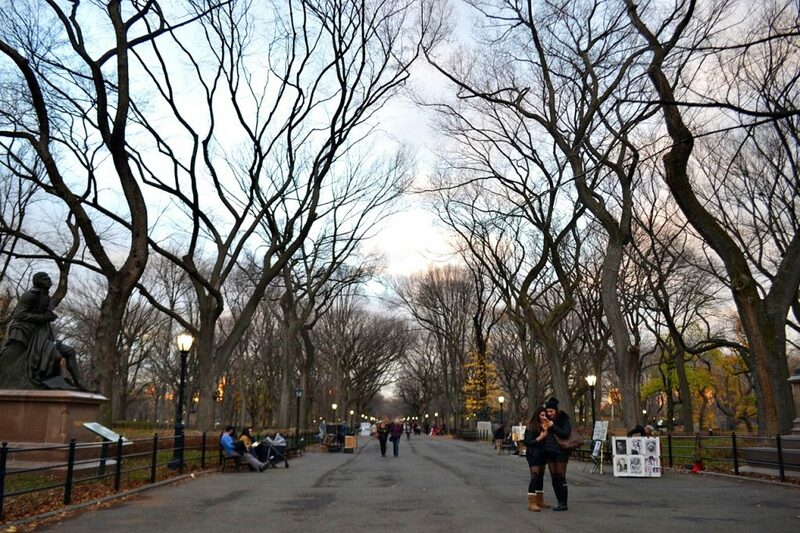 Stroll along The Mall in Central Park. Central Park, to put it simply, is HUGE. I knew it’s over 840 acres (or 340 hectares) — thank you, Wikipedia! — but I still wasn’t prepared for how big it really is. I went in via the Columbus Circle entrance and told myself I would spend the rest of the day (around 5 hours) going from one end of the park to the other. What a laugh. I looked at the map later on and realized I only covered a tiny portion of it. On hindsight, I should have booked a Central Park Pedicab Tours, which entails going around Central Park on a pedicab (what else, right?). I would have seen more, given the very limited time I have. Their 3-hour tour, which covers A LOT of attractions in Central Park, costs only $135. Pretty worth it, if you ask me. 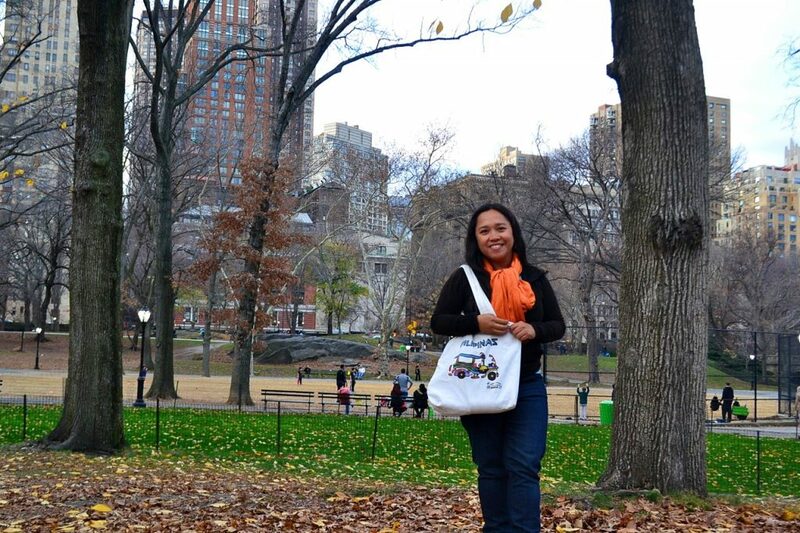 In any case, despite the lack of preparation, I was still able to do a few things in Central Park. Here are some of the things you can do, too. Walk around and enjoy the moment. It is SO EASY to be overwhelmed in Central Park. After all, this place is one of the most filmed locations in the world, and if you watch Hollywood movies (as many Filipinos do), you will easily identify the locations used in some movies. There’s Serendipity (that scene in the skating rink! ), Breakfast at Tiffany’s, The Avengers (I was there at Bethesda Terrace! ), Spider-Man, Night at the Museum, When Harry Met Sally, Enchanted, and of course, my favorite Natalie Portman film, The Professional, among many others. My tip: stop trying to associate the sights to the movies and just enjoy your walk. Once I consciously did that, I was able to enjoy my walk a little more. 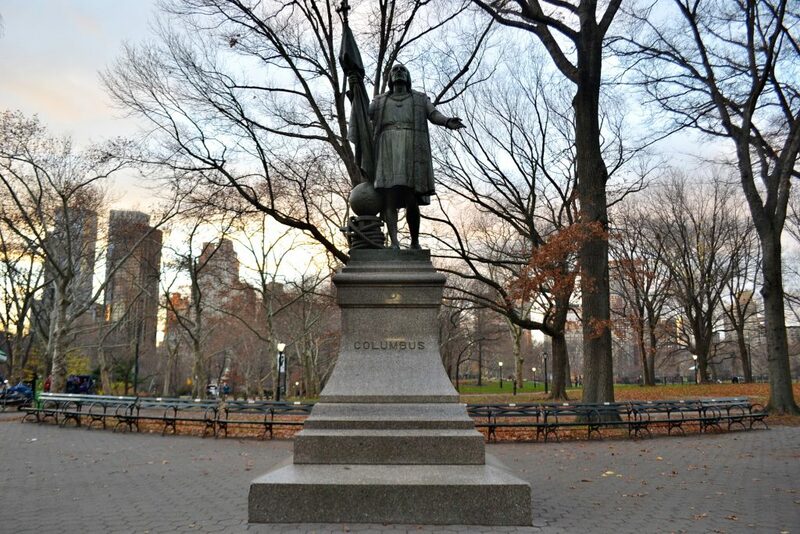 A statue of Christopher Columbus in Central Park. The Mall in Central Park is not a shopping mall at all, but a walkway leading to Bethesda Terrace. It has four rows of American elms, one of the largest stands in the whole North America. At the southern end is what is called the Literary Walk, where you can find a statue of Christopher Columbus and four prominent writers, Robert Burns and Sir Walter Scott. This is where I spent time the most. I just sat on one of the benches and people-watched. There was also some kind of street market at that time; there were stalls selling 360 degree photos of New York, paintings, bric-a-brac, and other kitschy souvenirs that all tourists seem to love. 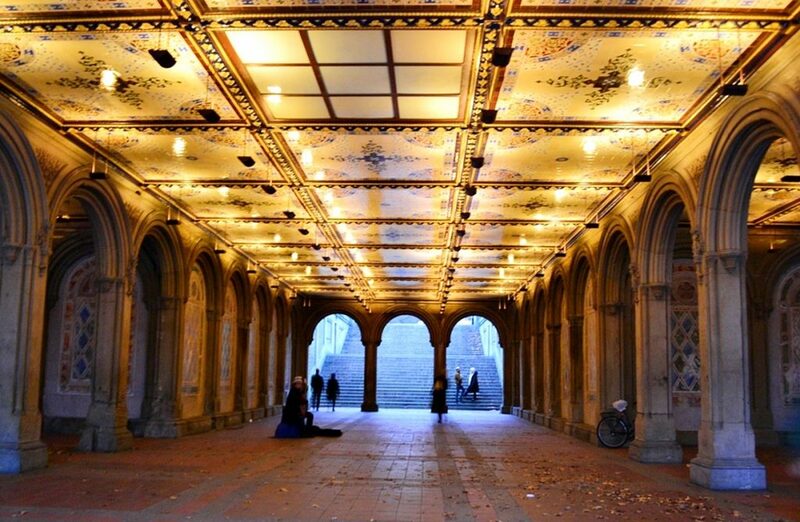 Watch street artists perform at Bethesda Fountain and Terrace. 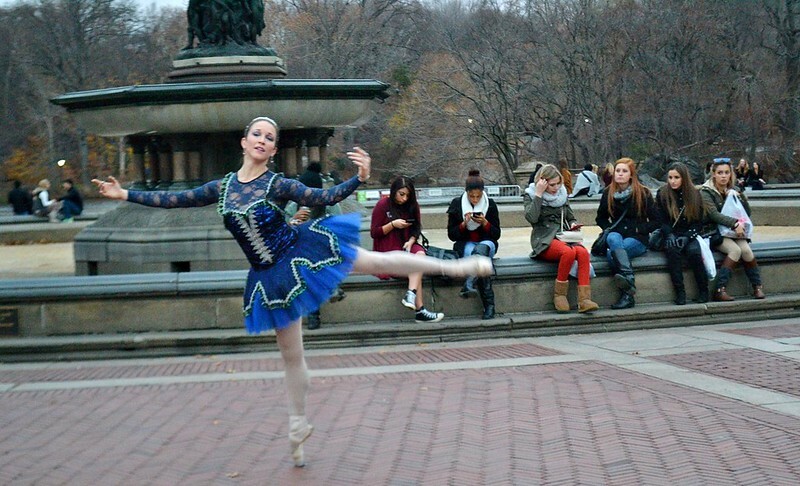 The ballerina in Central Park. 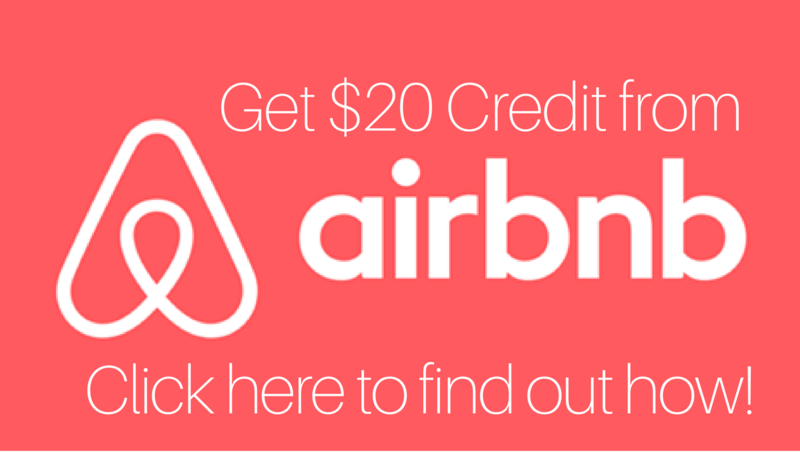 Living in New York can be harsh on the budget (a night in a hostel’s 12-bed dorm, for example, will set you back over $50! ), so people resort on doing whatever needs to be done to earn rent money. Talented dancers and singers, for example, perform in the streets while waiting for their big break. 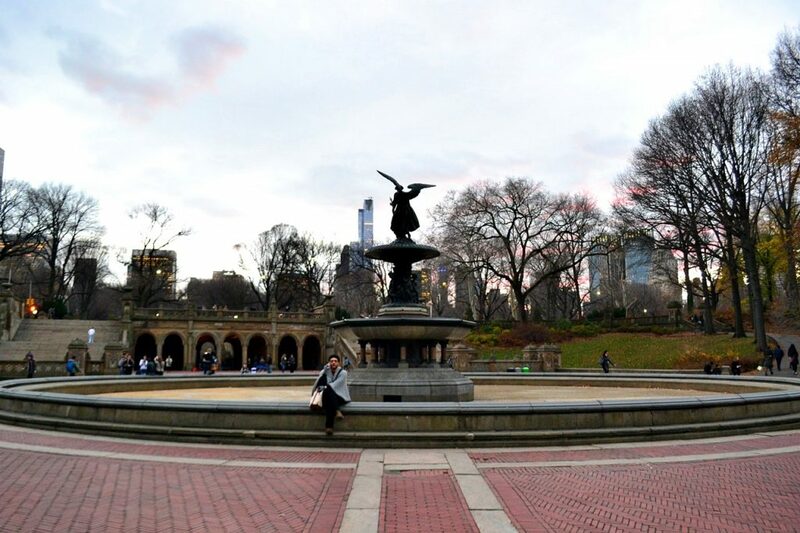 I came upon Bethesda Fountain unexpectedly, attracted by the sight of a ballerina in blue tutu dancing. She was fantastic and quite talented for sure. Unfortunately, there weren’t that many people around, and some were not even paying attention. No water in Bethesda Fountain in winter. The beautiful Bethesda Terrace in Central Park. It made me sad for some reason. Artists don’t earn much, especially from dancing on the streets. The least they could get from it is appreciation. I made sure to stay until the end of her performance, and of course, put in a few dollars as well in the donation box. If you’re there on a weekend, make sure to go to Bethesda Terrace any time in the afternoon and catch the Crowtations in the act, a group of four puppeteers lip-synching R&B classics. Too bad I never had a chance to see them perform! Eating hotdogs in New York: a must do? If I lived in New York, I would do this every week. Just bring a sandwich, drinks, and a book (or my Kindle) and I’m set for the whole day. Central Park is the best place to do nothing in; just plop down somewhere and observe people (or read) and you will have the most relaxing time ever. There are so many places to choose from that it really boggles the mind. Whether you want to lie down in the grass or on the rocks, or just sit on the bench or staircase, there’s bound to be a place for you. Don’t want to bring food with you? 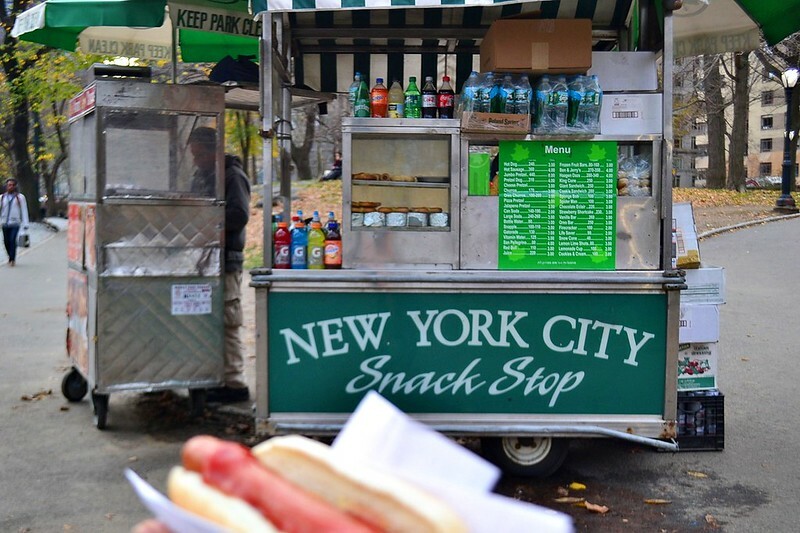 Not to worry, there are loads of food carts in Central Park, including the much-touted hotdogs. The taste is nothing to write home about, though. 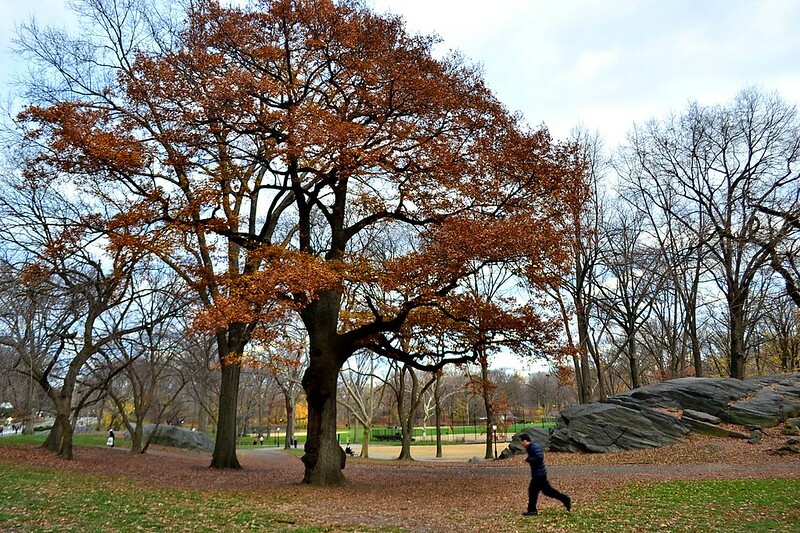 Is Central Park Safe for Solo Female Travelers? This is the best I can do with a timer and no tripod. Central Park is not only fun during the day, going there in the evening can be enjoyable, too. There are so many things you can do in Central Park at night, including running, attending concerts and plays, or going ice skating. However, it goes without saying that as solo female travelers, we should always be careful when we’re traveling, and that’s including Central Park. Common sense, for example, will tell you not to go inside when it’s closed (1am to 6am), and when you do go at night, stick to the well-lit paths. I did end up walking around there at night (because I had so little time and wanted to maximize my visit there), and the sheer vastness of the place humbled and scared me at some point. There were some dimly-lit areas which made my heart beat a little faster, but I just walked fast and paid attention to my surroundings. I would definitely love to go back to the Big Apple and spend a longer time there. Revisiting Central Park and Times Square, however touristy they may be, is still on top of my list. Indeed, there’s nothing like New York! 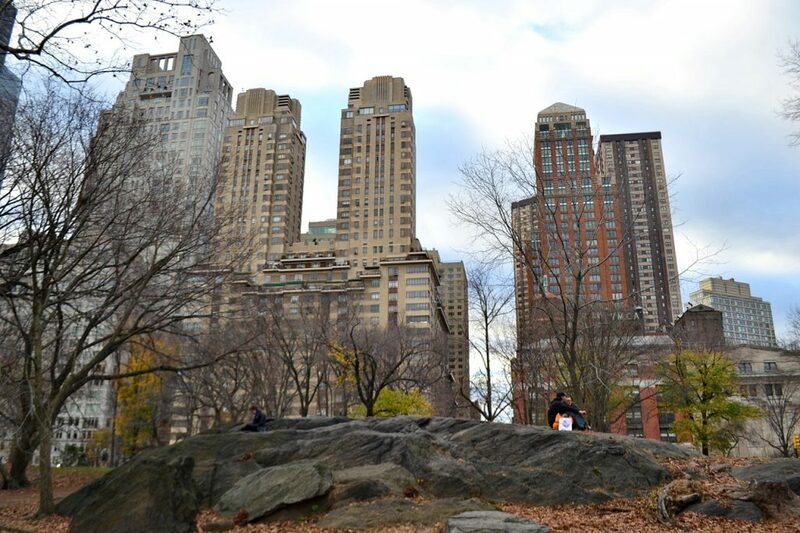 Have you been to Central Park? What other activities can you recommend? Central Park is my favourite place to go in NYC to escape the concrete jungle. I enjoy going for a run there on a brisk morning. Mostly, if I’m in Central Park, I’m there to breathe some fresh-ish air, reflect, and people watch. Central Park is awesome. I agree, it’s a great place to bring food or a book to read. I will advise against going in the park at night, even if you are with some people just to be safe. There are still bad people who will target those who are alone. Central Park is front and center with respect to the attractions I hope to see in NYC … thanks for giving us a look from your perspective! 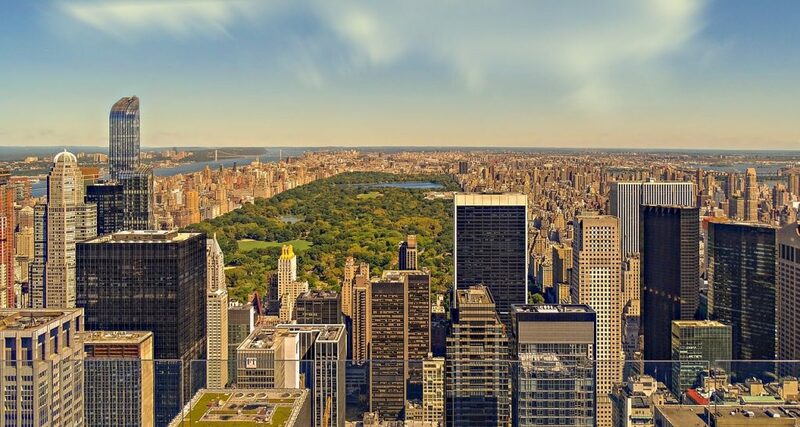 Have always wanted to visit Central Park…very famous place, i think it will take more than a day. Love it Aleah 🙂 I am a 2 minute walk from Central Park West now. House sitting for 2 weeks on the Upper West Side. I ran for an hour in the Park this morning. Short walk after I finish leaving this comment 😉 This really is one magical place in the City and in the world when you consider its scale. I have been in the Park hundreds of times; still see new spots I had never discovered, from time to time. One of my bucket list items is to ice skate in Central Park ala Gossip Girl/Serendipity – but maybe not anytime soon. 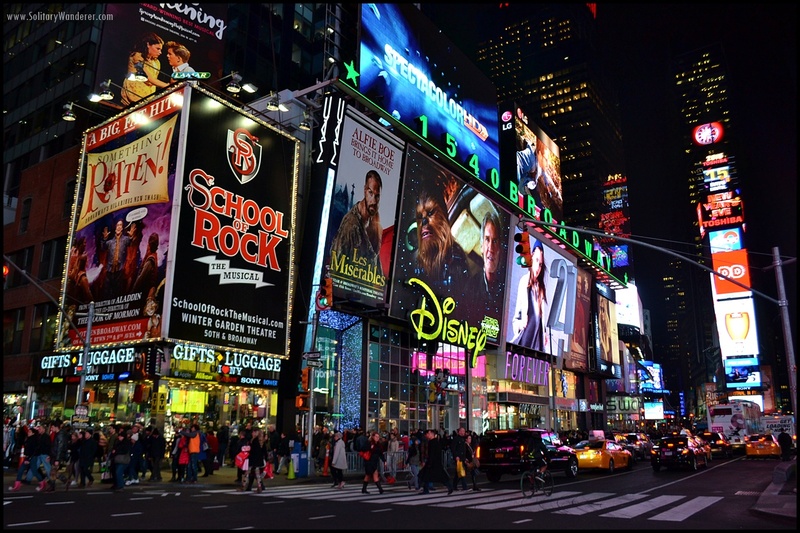 What Broadway shows did you watch? I bet it was so much fun! Travel envy! I also like to people watch and Central Park is a good place for that! There are some rowboats in Central Park, the next time I go there, I would like to try them out! One day is not enough for this popular park. I like that it’s an oasis in the heart of a big metropolitan. BTW, as large as Central Park is, Golden Gate Park in San Francisco (a smaller city) is a bit larger in size.